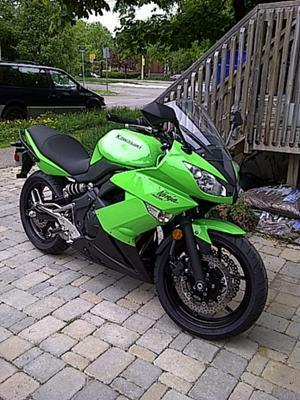 Well I'm new to this sport since I completed my course in early May...So far I have put 109km on my 2011 Kawasaki Ninja 400R. It's been great, but I have learned a lot! Just wondering if anyone has had experience with either saddle bags for a sports bike or a backpack with a sports bike? I haven't started communiting with my bike yet, just trying to get comfortable in traffic. For me that has been the best option. Hard cases are waterproof, too. You can get soft side bags that are fairly weather proof, if you are just commuting that is what I would suggest, or just a tail bag. I think a backpack would be distracting and uncomfortable. I've been looking for saddlebags for my little sport bike too. I use her for commuting to work and have a small tank bag. I've been using a backpack but don't like it. I've found several companies online but it always good to hear from the gals who already have them. I have a Ninja 500R and a Moto Guzzi v-7 cafe I use the same saddle bags on both bikes they are made by Nelson Rigg and are great for going to work a little shopping or add the tail bag and I can go for a week. There is a picture of my Ninja with all the gear on this sight under users bikes check it out. When I first got the Guzzi I used a backpack I found out quick it wasn't for me very uncomfortable and limited in what I could carry. Just try stopping for a gallon of milk on your way home from work. Enjoy your new bike, I love the color.